The Lumberjack Press is one of those old school moves that were commonplace in the 1940’s and 1950’s, but can’t be found in modern gyms. Fortunately, with the recent popularity of all things vintage, this move is being dusted off and re-examined in terms of its ability to max out the shoulders. In this article we’ll get up close and personal with the Lumberjack Press, see how it fits into a shoulder workout, and we’ll consider some alternatives to the Lumberjack Press. The Lumberjack Press, also known as the Rainbow Press or the Alpha Press, is a variation of the standard overhead barbell press. It’s big point of difference is that it, rather than holding the barbell parallel to the body, it is held in a perpendicular position. This makes the exercise look rather difficult and clumsy to perform, which may put people off. However, once you actually give this move a try, you’ll soon see how natural it feels. You’ll also notice how effectively it works your shoulders. The Lumberjack Press works all three heads of the deltoids. However, the focus is on the middle, or lateral, head. This is the part of the shoulder that provides the width to the deltoids, accentuating that much sought after ‘V’ taper to the upper body. This exercise is also an effective way to develop your balance and coordination around the shoulder joint. It also does a great job of working the smaller, synergistic muscles that surround the shoulder area. Place a barbell on a rack at the level of your shoulders. Load the barbell with a relatively light weight (start lighter than you can comfortably handle in order to get used to the movement). Now, stand alongside the bar and grab a hold of it the middle of center knurling. Take an overhand grip with your right hand and an underhand grip with your left hand so that the hands are together. Lift the bar off the rack and rest it on your right shoulder so that it is running length wise in a perpendicular position in relation to your torso. Now, without using momentum or leg drive, power the bar overhead, across and down to your left shoulder. Continue this movement in a back and forth motion until the set is complete. Try to complete the movement in 3 seconds and then move directly into the next rep without a pause. On your next set, change the positrons of your hands so that your left hand is forward. This will alter the emphasis from the right to the left lateral head of the deltoids. Stand in front of a landmine apparatus that has a barbell loaded with a relatively light weight. Take an overhand grip with your right hand and an underhand grip with your left hand so that the hands are together, holding the end of the bar. With your feet shoulder width apart, your spine in a neutral position and your scapula depressed, hold the bar on your right shoulder. The Landmine Press is a good lead in exercise to the Lumberjack Press for people who don’t quite have the balance and coordination required for the latter move. Because the bar is secured to the ground, you have more of a secure bar position to work from. This makes the move at the same time easier and less effective. After 3 weeks of performing the Landmine Press, you should be ready to advance to the Lumberjack Press. Sit with a pair of dumbbells resting at shoulder level with your palms facing forward. Brace your core and push the weights directly overhead until your reach a position just short of lockout (you don’t want to lock out because this takes the tension off the target muscle). Slowly lower back to the start position and repeat. Load a barbell onto a power rack at shoulder height. Stand in the rack and grab hold of the bar slightly wider than shoulder width. Now unrack the bar and rest across the front of your upper body so that it is running across your upper pecs and front delts. With a strongly braced core, neutral spine and depressed scapula, push the bar overhead until you are just short of lockout. Lower the bar slowly and repeat. Hold a pair of dumbbells at chest level as if you had just completed a set of dumbbell curls (palms facing inward and elbows in at your sides). Holding the dumbbells tightly, press them overhead. As the dumbbells go up, rotate them so that your palms are facing away from you in the top position. Pause and then slowly reverse the motion, returning to a palms facing position at the bottom of the press. Perform the exercise in a slow, controlled manner. Even though it is a pressing movement, the Lumberjack press should not be considered a heavy mass movement. Because it requires a lot more balance and coordination than any other press, you will not want to go as heavy on this move as you would on most other pressing exercises. You should also perform the Lumberjack Press in a more continuous manner than other overhead presses. You will be going from one a left-hand press to a right hand press in a continual non-stop motion. This means that there should be no separation between the reps within each set. The Lumberjack Press is best used as a finishing exercise at the end of your shoulder workout. 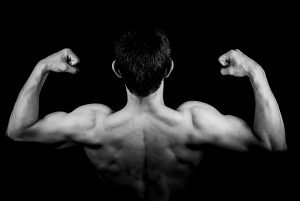 The goal of the exercise should therefore, be to eke out the last vestiges of strength and energy from your delts in order to fully fire every muscle fiber. That means training to failure on your sets. Stand with your heavy dumbbells in your hands and hanging at your sides. This movement simply involves shrugging your traps as high as you can in an up and back motion. Imagine trying to get them all the way up to your ears. Perform the movement slowly deliberately and do not straighten your arms. Perform three sets of 10 reps on this movement. Hold two dumbbells, one in each hand, at your sides, palms facing your sides. Your feet should be shoulder width apart with your knees slightly bent. Tense your core as you raise the weights to shoulder level (no higher). While you are lifting the weights out to the side, pretend that, instead of dumbbells, you have pitchers of water in your hands and that you are going to water some plants up at shoulder level. Allow your elbows to bend and your forearms to drift slightly forward. As you reach the top of the movement, rotate your shoulders forward so that the front plates of the dumbbells are slightly lower than the rear plates – just as if you were pouring water. This will cause you to raise your elbows slightly. The rotation needs to come from your shoulders, not your wrists or arms. Perform 3 set of 12 reps on this exercise. Load a high cable pulley machine with a moderate weight. Place a rope handle on the pulley and grab a hold of the handles. Face the machine at a distance of about three feet. Maintaining a neutral spine, and with depressed scapulae, extend your arms to full extend in line with your chin. No, keeping the elbows high, pull the rope back to the level of your forehead. Your elbows should travel back an up so that in the finish position they are beyond your elbows. Hold for a second and then return slowly. Perform 3 sets of 15 reps on this exercise.